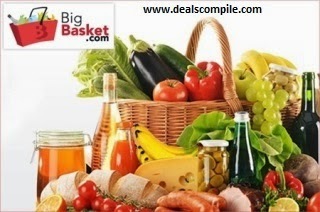 Offer: BigBasket is offering 40% off on all orders . 1. 20 % Discount through the coupon code. 5.On the payment page , choose wallet option as payumoney and proceed. 6.Pay the amount through payumoney. *Coupon is valid only for new user. *Both the offers can be combined. *Minimum order value should be Rs.1000 for getting 20% discount through the coupon code. *Payumoney 20% CB Offer can be availed for any amount of order. *Combining both the offers results in net 36% Discount to be precise. *Big Basket delivers in Mumbai,Delhi ,Chennai ,Hyderabad , Pune and Bangalore only at present.